In honor of my old friend Dr. Cossack celebrating his tenth year as a webmaster in the Mega Man community, I’d like to present Rockman 4 like you’ve never seen it before — in Rockman Diorama World! 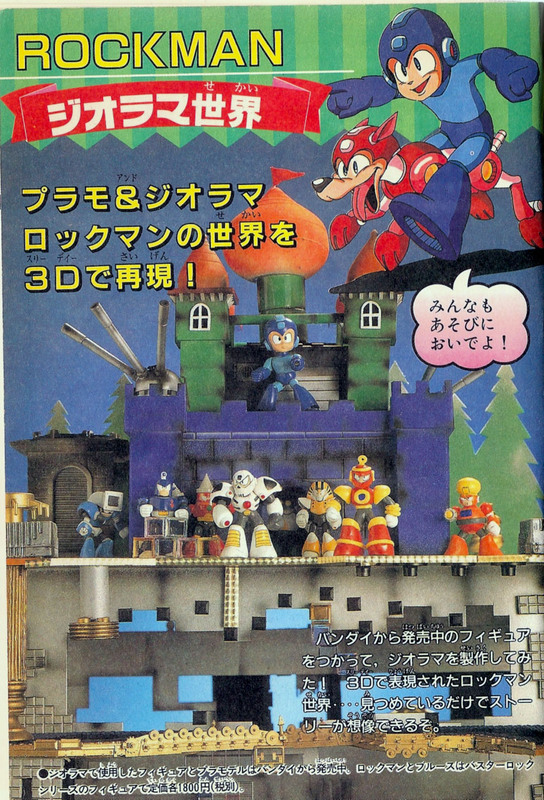 USING PLAMO & DIORAMAS, THE WORLD OF ROCKMAN RETURNS IN 3D!! Everybody can come and play! Using figures that are on sale now from Bandai, we put together this diorama! 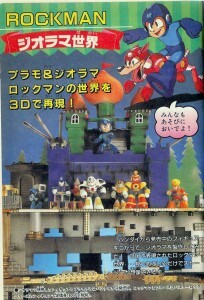 Rockman’s world presented in 3D…. Just gazing at it you can imagine the story coming to life! The figures shown in this diorama are made by Bandai and currently on sale. The Rockman and Blues “Buster Rock Series” figures are priced at 1800 yen each (tax excluded). A looming shadow draws near to Rockman… it’s that master of solar power, Pharaohman! Suddenly, Drillman appears overhead! Rockman’s in a pinch now! Posing with Skullman, Dr. Cossack observes Rockman’s battles. Probably scheming up some new robot remodeling ideas, perhaps? With his arms crossed like that, he sure doesn’t look to be in a very good mood! The Rockbuster is charged, ready and waiting for any sudden enemies that might appear. Who knows what kind of opponents could be rushing in at any moment….? That fearsome foe Diveman has emerged! Checking his leftover energy reserve, Rockman has little time to prepare before the battle begins! At last, Dr. Wily has shown himself! Get your weapons ready for a climactic confrontation! 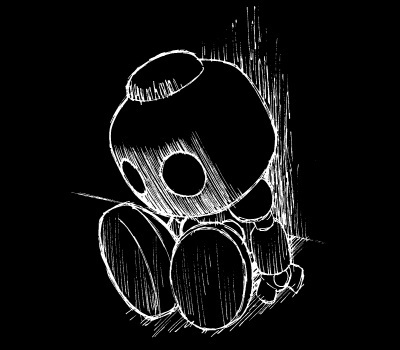 Even that most mysterious of characters Blues makes an appearance in Diorama World! Shield at the ready, Blues appears on the scene! His yellow scarf billows in the breeze. Standing by himself, Blues’ presence gives off an uneasy feeling. Is he friend or foe….? He seems to be acting as an ally in “Rockman 4”, however…. Blues’ activities are shrouded in mystery. 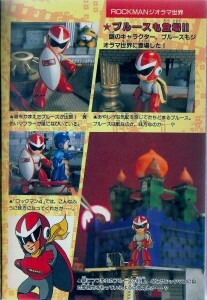 And yet, he seems to be familiar with Rockman somehow….? 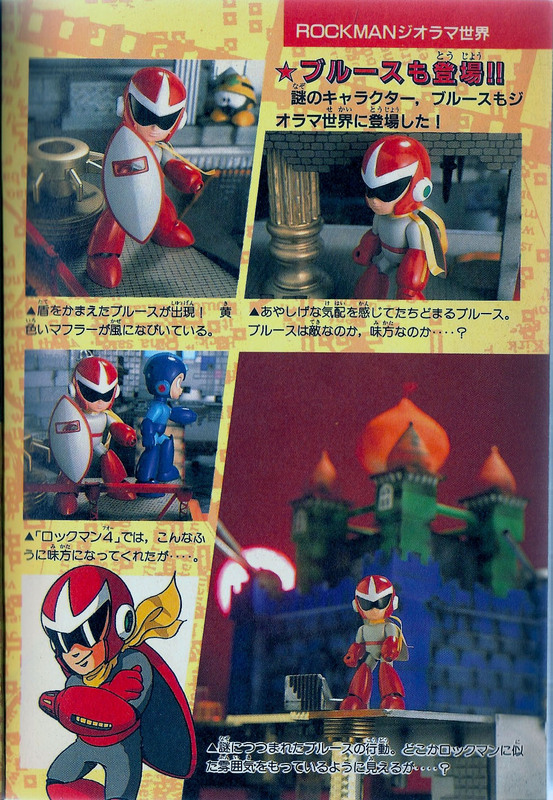 These pages appeared in Comic Bom Bom Special #87, the Rockman Daizukan. When I was younger, I thought that the people who made dioramas like these for commercials and magazines had the best job ever. What’s cooler than putting together awesome things and getting to play with them? I’m still amazed at what people can do with models, photography and stop-motion. 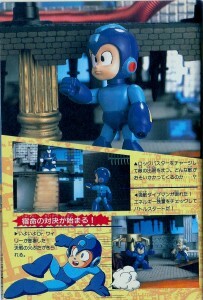 I hope that we’ll see some inspired fans putting some of the new Rockman toys and model kits to good use like this. 5 Comments to "The Siberian Citadel — they don’t build ’em like that anymore!" Ooh, so there IS a figurine of Dr. Cossack somewhere out there… I was wondering if such a thing ever got done. It's most likely impossible to find anymore, of course, but still. OK. Is even there a FULL COLOR edition of the Rockman 4’s Bandai keshi. I only see the monochromatic keshi? The paint jobs on the small figures here were custom. The Rockman 4 collection box only had uncolored figures. 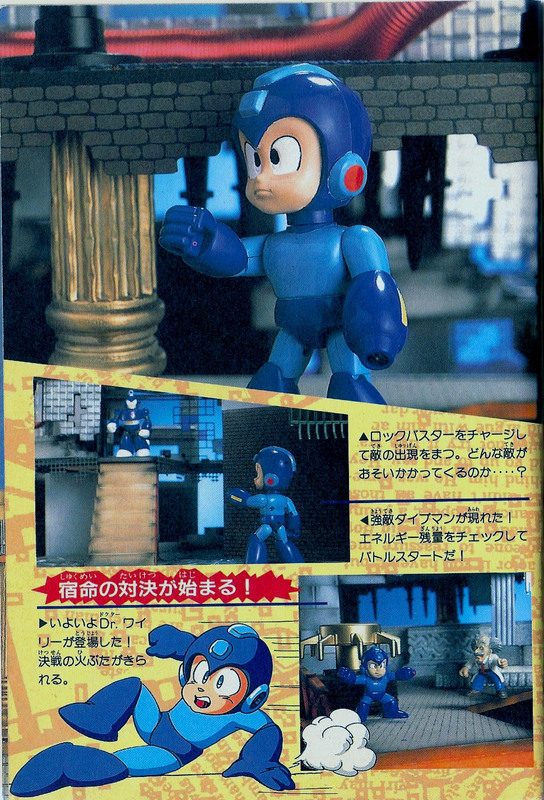 The Rockman 5 set were the first that had full color. Maybe enough people were disappointed by the lack of color with the first that they put the extra effort in. The larger Buster Rock Rockman and Blues figures were released in color though, I believe. 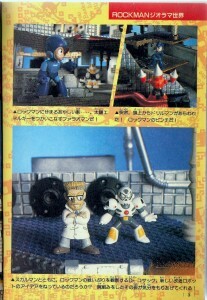 I saw these — well, the Rockman and Blues figures — in Nintendo Power, if I’m not mistaken, and wanted them so, so very badly.